Prototype: German Federal Railroad (DB) class 211 diesel locomotive. The locomotive looks as it did around 1980. Model: The locomotive has an mfx+ digital decoder and extensive sound functions. It also has controlled high-efficiency propulsion. The triple headlights and dual red marker lights change over with the direction of travel, will work in conventional operation, and can be controlled digitally. Warm white and red LEDs are used for the lighting. The locomotive has detailed buffer beams. Brake hoses that can be installed on the locomotive are included. Length over the buffers 13.9 cm / 5-1/2". One-time series, only in 2014. 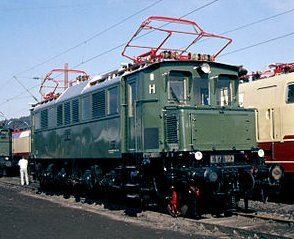 Prototype: German Federal Railroad (DB) class 117 older design electric locomotive. Chrome oxide green basic paint scheme. Road number 117 107-3. The locomotive looks as it did around 1975. Model: The locomotive has the new mfx+ digital decoder and extensive sound functions. It also has controlled high-efficiency propulsion with a flywheel. 2 axles powered. Traction tires. The engineer's cabs and the engine room have interior details. Handrails and other details are separately applied. The roof is finely detailed, with transversely mounted support insulators on the pantographs, as well as the bell-shaped insulators and fluted insulators. The triple headlights and dual red marker lights change over with the direction of travel, will work in conventional operation, and can be controlled digitally. The headlights at Locomotive End 2 and 1 can be turned off separately from each other. When the headlights are turned off at both ends of the locomotive, then the "double A" lights function is on at both ends. The lighting is maintenance-free, warm white and red LEDs. Brake hoses, heating lines, and covers for the pilot trucks are included. Length over the buffers 18.3 cm / 7-3/16". Prototype: German State Railroad Company (DRG) class elT 1999 "Glass Train" electric powered observation car. Beige / brownish green paint scheme. The car has simple lamps on the ends, Wendler air intake pumps for ventilation, an air whistle on the roof, no railroad radio, and 2 double-arm pantographs. The car looks as it did around 1935. Model: The car has an mfx+ digital decoder and extensive sound functions. A welcoming announcement from the period as well as a list of destinations, a photo stop, and the end station (surrounding sounds 1, 2, 3) can be activated by means of the function buttons. The car also has controlled high-efficiency propulsion. 2 axles in one truck powered. Traction tires. The car has built-in interior details. The car comes from the factory with a driver and numerous passengers. The car has factory-installed interior lighting. The dual headlights and dual red marker lights change over with the direction of travel, will work in conventional operation, and can be controlled digitally. The lighting is maintenance-free, warm white and red LEDs. The interior lighting can be dimmed as a digital auxiliary function. The trucks have different wheelbases like the prototype. The panorama windows are inset. The car has double Wendler air intake pumps and an air whistle on the roof. This car is the version with 2 double-arm pantographs. Length over the buffers 23.7 cm / 9-5/16". Prototype: German State Railroad (DRB) class 05 streamlined express steam locomotive. Version with powdered coal firing and the engineer's cab at the front. Wine red basic paint scheme. Road number 05 003. The locomotive looks as it did around 1937. Model: The locomotive has the new mfx+ digital decoder and extensive sound functions. Different sounds of powdered coal being moved with a compressor (Operating Sounds 1, 2, 3) can be activated by means of the function buttons. The locomotive has controlled high-efficiency propulsion with a flywheel, in the boiler. 3 axles powered. Traction tires. The locomotive and tender are constructed mostly of metal. Minimum curved for operation is 360 mm / 14-3/16". Cutouts in the side streamlining for smaller track curves can be filled in with add-on fill pieces. The dual headlights change over with the direction of travel, will work in conventional operation, and can be controlled digitally. A third headlight as a headlight for oncoming trains can be controlled separately in digital operation. The engineer's cab lighting can be controlled separately in digital operation. Maintenance-free, warm white LEDs are used for the lighting. The locomotive and tender have numerous, separately applied grab irons. A 7226 smoke generator and a figure of a locomotive engineer are packed at the factory with the locomotive. There is a permanent close coupling between the locomotive and tender. Length over the buffers 31.0 cm / 12-1/4". Smoke generator and locomotive engineer figure packed at the factory with the locomotive. The 39053 streamlined steam locomotive is being produced in 2014 in a one-time series only for Insider members. 05 003 – Steam Locomotive with a Cab on the Front In 1933 the German State Railroad Company (DRG) contracted with the firm Borsig to design and build two three-cylinder streamlined steam locomotives as the class 05 to reach speeds as high as 175 km/h / 109 mph and beyond for the first time. As early as the presentation of the designs, there were doubts whether the locomotive crews would be able to monitor the track and the signals sufficiently at 175 km/h / 109 mph. The decision makers therefore requested development of a third locomotive with the same performance but with the cab at the front of the locomotive as with electric locomotives. In 1934, the DRG thereby ordered a third high speed locomotive from Borsig as road number 05 003 with a cab located at the front. Since the locomotive engineer and fireman were not to be separated, the Borsig designers came up with a 4-6-4 plan in which the outer firebox was located in the rear relative to the main direction of operation, while the tender was coupled behind the smoke box. However, this design permitted only oil firing or powdered coal firing. Since oil firing was not considered give the raw material situation at that time, the decision was made to equip the locomotive for powdered hard coal firing. In the fall of 1937, the first test runs took place on the route Berlin – Hamburg. At this time, powdered hard coal was not yet available. The decision was therefore made to run with powdered lignite. As expected there were no problems in terms of combustion, however the maximum speed reached was 156 km/h / 97 mph. Subsequent attempts with powdered hard coal did not achieve considerably better results. World War II prevented fundamental modifications and the locomotive was therefore stored for a long time. When the shortage of locomotive increased sharply in the summer of 1944, road number 05 003 was remembered and by February 14, 1945 it was converted at Hennigsdorf to a normal version for lump coal firing. On February 15, 1945, it was assigned to the Hamburg-Altona district where it was used for various purposes and then it remained in storage until May of 1947. Subsequently it was transferred to the Hamm District at the request of the British Occupation Authorities and after an overhaul was used in scheduled express train service between Hamm and Cologne until it was placed in storage again in October of 1947 due to damages. At the start of 1950 road number 05 003 as well as road numbers 05 001 and 002 were overhauled again at the firm Krauss-Maffei in Munich. After that, it along with its siblings went to the Hamm District and were now used fully in railroad operations. These locomotives were given a three-day service plan and from 1951 on, they had their longest run between Hamburg and Cologne at 478 km / 299 miles. From 1953 on, they even ran for a short time between Hamburg and Frankfurt (Main) a full 703 km / 439 miles. At this time, these units gave their best performance. Road number 05 003 reached a proud 22,345 km / 13,966 miles in August of 1954. In the summer of 1955, these units shined in "F-Zug" express service with the trains F 1/2 “Hanseat”, F 13/14 “Dompfeil”, and F 16 “Sachsenross”. However, they were not to have a long life, because as a minor class they were on the cut list. Road number was stored in operating condition on September 9, 1957, was ordered into retirement on June 16, 1958, and was scrapped in 1960. In its relatively short working life it achieved a remarkable 798,328 km / 498,955 miles. An express train passenger car set to go with this locomotive is being offered under item number 43256 exclusively for Insider members. Prototype: 6 different design German State Railroad (DRB) express train passenger cars. Version as D 12 for the train route Berlin - Stuttgart. 1 type C4ü-23 "Hechtwagen" / "Pike Car" express train passenger car, 3rd class. 1 type WR4ü(39) MITROPA "Schürzenwagen" / "Skirted Car" dining car. 1 type AB4ü-38 "Schürzenwagen" / "Skirted Car" express train passenger car, 1st/2nd class. 1 type C4ü-39 "Schürzenwagen" / "Skirted Car" express train passenger car, 3rd class. 1 type Pw4ü-23 "Hechtwagen" / "Pike Car" express train baggage car. 1 type Post4ü-a German State Postal System "Schürzenwagen" / "Skirted Car" express train mail car. The cars look as they did at the end of the Thirties. One-time series for the 2014. One-time series for the 2014 MHI. Prototype: 3 different design German Federal Railroad (DB) fast passenger train cars for the train route Augsburg - Donauwörth - Treuchtlingen - Nürnberg. 1 type MDyge 986 express freight baggage car as a temporary baggage car, with walls sheathed with panels. 1 type ABm 225 express train compartment car, 1st/2nd class. 1 type Bm 234 express train compartment car, 2nd class. All of the cars in a chrome oxide green basic paint scheme. The cars look as they did around 1975. Model: The minimum radius for operation is 360 mm / 14-3/16". The temporary baggage car has "Pennsylvania" style trucks. The express train passenger cars have Minden-Deutz heavy design trucks. All of the cars have factory-installed interior lighting with warm white LEDs. The express train passenger car, 2nd class, has a factory-installed pickup shoe. The entire consist of cars can be supplied with power by means of the factory-installed, current-conducting couplers. The cars must be coupled together in a permanently defined order to do this. Total length over the buffers 83.2 cm / 32-3/4". Prototype: 2 German State Railroad Company (DRG) type Geh "Hannover" (Bavarian design) boxcars, with curved roof, heating coupling, and without handbrakes. Used as milk cars to ship "fresh milk to Munich stations". 1 truck with a flatbed to transport milk cans. Grayish white basic paint scheme. Both cars and the truck look as they did around 1930. Prototype: Lokomotion GmbH class 139 electric locomotive painted and lettered for Era VI. Model: The locomotive is an Era VI version with Klatte individual vents and rectangular buffers. The screw switch for selecting catenary operation is pointed to the inside of the locomotive. Both trucks powered. The triple headlights with warm white LEDs change over with the direction of travel. The locomotive has dark nickel-plated wheel treads. Length over the buffers 76 mm / 3". Prototype: Car set consisting of 3 German Railroad, Inc. (DB AG) type Sdgkms 707 flat cars. Designed for the transport of containers, truck interchangeable load units, or even semi-truck trailers. Model: The car frames are constructed of metal. Each car is loaded with 2 removable truck interchangeable load units for the freight forwarder "Winner". The cars and loads have finely executed paint schemes and lettering. All of the cars and the interchangeable load units have different car numbers or registration numbers. The cars have built-in close coupler hooks. Total length over the buffers 234 mm / 9-1/4". Prototype: German State Railroad Company (DRG) class 05 003 steam locomotive with the engineer's cab at the front, the so-called cab forward. Model: This locomotive is an exquisite, completely equipped brass handmade model in the elegant red paint scheme of the DRG in Era II. It is technically perfectly crafted out of etched brass parts. The locomotive is equipped with a powerful can motor with a bell-shaped armature that powers a metal gear drive. All driving axles powered. The triple headlights are warm white LEDs that change over with the direction of travel. The upper lights (headlight for oncoming train) can be turned off separately by means of a switch. The locomotive has open brass spoked wheels. The spacing between the locomotive and the tender can be adjusted. The engineer's cab has windows and a reproduction of the cab interior. Fill-in pieces are included for the cutouts on the skirting so that the model can be displayed perfectly in a display case. Additional detail parts are included to complete the buffer beam on the rear of the tender. The locomotive comes with the Märklin Z coupler on the rear. The locomotive has many separately applied lines and details. The brake imitations as well as sand pipes and rail clearance devices are indicated. The buffers have straight and curved buffer plates. The minimum radius for operation is 195 mm / 7-11/16" (R2) due to the fine detailing and the length of the model. Length over the buffers approximately 126 mm / 5". The locomotive is packaged in a real wood case, and the set also has a replica of the builder's plate made of metal. First time for the edition of a Fine Art handmade model in fine brass construction. Powerful can motor with a bell-shaped armature. Reproduction of the engineer's cab interior. Fill-in pieces included for the skirting cutouts. Upper headlights for oncoming trains can be turned off separately. Packaged in a high quality wooden case. Metal replica of the builder's plate included. Prototype: Different 4-axle tank cars painted and lettered as privately owned cars, used on the German Railroad, Inc. (DB AG). Chlorine gas tank cars painted and lettered for the firms On Rail and VTG. Model: The cars come in an attractive display of 6 each chlorine gas tank cars painted and lettered for the firm On Rail and 4 each chlorine gas tank cars painted and lettered for the firm VTG. All of the cars have different car numbers. The cars have detailed, partially open frames. They have Minden-Dorstfeld type trucks. The cars have separately applied brakeman's platforms and separately applied ladders with platforms specific to the type of car. Each car is individually packaged. Length over the buffers for each car 80 mm / 3-1/8". Highlights: New tooling. Car type differences. Prototype: 4 fast passenger trains as they looked around 1971 for the Hamburg-Altona - Westerland service. Two type Bnb 719 "Silberling" / "Silver Coins" cars, 2nd class, one type Bye 655 car, 2nd class, and one type ABüm 225 car, 1st/2nd class car, all painted and lettered for the German Federal Railroad (DB). Model: All of the cars have close coupler mechanisms. Lighting kits can be installed in the cars. The 1st/2nd class car has LED marker lights that can be shut off by means of a micro switch. Total length over the buffers 660 mm / 26". 66656 Lighting kit. 66616 LED lighting kit. A suitable fast passenger train can be made up with this set and the diesel locomotive, item number 16771. Highlights: Many sound functions. Warm white LEDs for headlights. Engineer's cab lighting. Headlights / marker lights can be turned off. The Class 151 The class 151 appeared in 1972 as a further development of the 150 (until 1968: E 50) due to increased performance demands in heavy and fast freight service. Its design was based on the new parameters of the railroad construction and operation regulations (EBO) off 1967, which stipulated freight service speeds of up to 120 km/h / 75 mph and trainloads up to 2,000 tons. These values could only be reached with a locomotive of over 5,000 kilowatts / 6,075 horsepower so that just reworking the class 150 was out of the question right from the start. Krupp and AEG were responsible for the design of the 151. The proven traction motors from the classes 110 and 140 were selected in the interest of standardization but very new methods of insulation and heat dissipation had to be developed to reach the desired increase in performance. Despite that, the locomotive became so heavy with the necessary new more powerful main transformer and the reinforced resistance brakes that the required axle load could be maintained only with the utmost application of lightweight construction technology. The engineer's cabs were equipped with anatomically correct seats and air conditioning based on the latest technology. Equipping the locomotives with separately mounted buffer beams was obligatory. This enable easy installation of center buffer couplers. The proven trucks for the class 150 were not used and new ones were designed of welded steel lightweight construction. The box support and the wheel set steering by means of Lemniskaten linkage were taken from the class 103. The proven rubber ring spring drive was still used. A 29-step high-voltage relay system with thyristor power circuit breakers now handled control of the traction motor voltage. Road number 151 001 was the first unit to be delivered on November 21, 1972. By 1977, 170 units had been built at Krupp, Henschel, Krauss-Maffei, AEG, Siemens, and BBC. They were initially used all over West Germany and were even run at times with passenger trains. Road numbers 151 089-122 and in part still have automatic couplers ("Unicoupler") and ran for years mostly in m.u. double-head lashups with heavy ore trains on the routes Hamburg–Beddingen (5,700 tons), Venlo–Dillingen (5,130 tons), and Moers–Linz (3,220 tons). By 2009 after only locomotives from accidents had fallen victim to being removed from service, large numbers of the locomotive were placed in storage due to the economic and financial crisis so that the ranks of these six-axle units sank by half in the last four years. Yet, the class 151 found a new area of activity with private transport companies. The DB subsidiary RBH Logistics GmbH has had 16 units on its roster and five other units have found a new livelihood with other private companies too. The DB will also still need these elegant freight locomotives for several more years. Major overhauls are thus planned in 2014 for them. Prototype: German Federal Railroad (DB) class 230 large heavy-duty diesel locomotive. V 300 general-purpose locomotive as it looked in the Seventies. Model: The locomotive has a built-in digital decoder and a sound generator for operation with DCC, Selectrix, and Selectrix 2. It also has a motor with a flywheel. 4 axles powered. Traction tires. The headlights and marker lights change over with the direction of travel. The engineer's cabs have details in relief. The locomotive has close coupler mechanisms. Length over the buffers 127 mm / 5". Highlights: Digital decoder for DCC, Selectrix, and conventional operation. Sound circuit with realistic sound effects. The V 300 - A One-Off Model with 6 Axles. 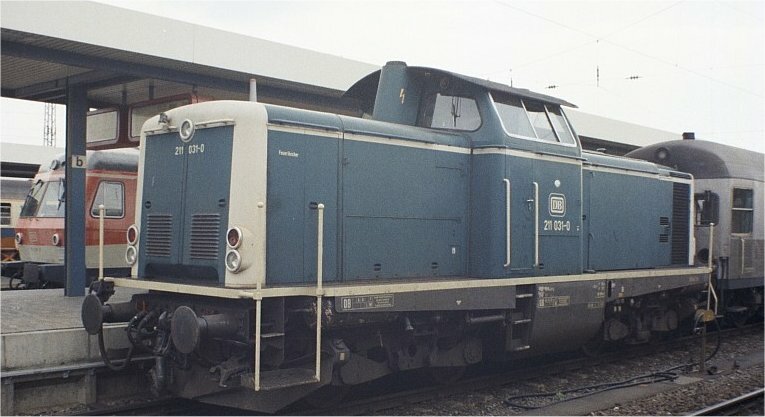 The firm Krauss-Maffei built three type ML 2200 6-axle locomotives for the Yugoslavian State Railroad; they were based on the German Federal Railroad's successful V 200. Probably in the hope of additional orders, a fourth, identical locomotive with the C-C wheel arrangement was built at Krauss-Maffei's own cost as a demonstrator unit. This locomotive was presented and offered in a striking builder's paint scheme to the German Federal Railroad among others. After several tests, the motor performance for this locomotive was increased and was designated internally at Krauss-Maffei as the type ML 3000 C'C'. It took long negotiations to move the German Federal Railroad to buy this one-off model and put it on its roster as road no. V 300 001. It was painted in the elegant crimson / gray color scheme of its four-axle siblings and was used primarily in premium express train service. In 1968, it was given the computer number 230 001-0 and this impressive machine could be seen in its last years in service between Hamburg and Westerland on the Isle of Sylt, where it also pulled the popular auto trains between Niebüll and Westerland. In 1975, road no. 230 001-0 was put in storage, and the German Federal Railroad tried to sell it, unsuccessfully however, to Italy in 1977. In 1978, it came back to Germany and was finally scrapped two years later. A suitable fast passenger train can be made up with this locomotive and the car set, item number 15471.